A colourful cartonnage collar once covering the neck and chest of a mummy has been restored after being found in pieces during excavations in 2000 and 2002. Cartonnage collar, part of mummy attire. TT 188, Luxor, Egypt, c. 300 BC. Photo: Susan Redford. Dating back around 2,300 years ago, the collar was found in TT 188, a tomb of the Theban necropolis originaly hewn 3,300 years ago for a butler named Parennefer who served the pharaoh Akhenaten. According to a common practice aiming to save time and “money” to the inhabitants of Luxor who wished to be buried in style, the tomb had been used continuously, initially by a man named Amenemopet and then by numerous others. The mummy who wore this collar is now gone or otherwise part of the various humans remains found in the tomb. Still, the hundreds of cartonnage fragments found by archaeologists (led by Penn State University archaeologist Susan Redford) were restored by the team’s artist Rupert Nesbitt. 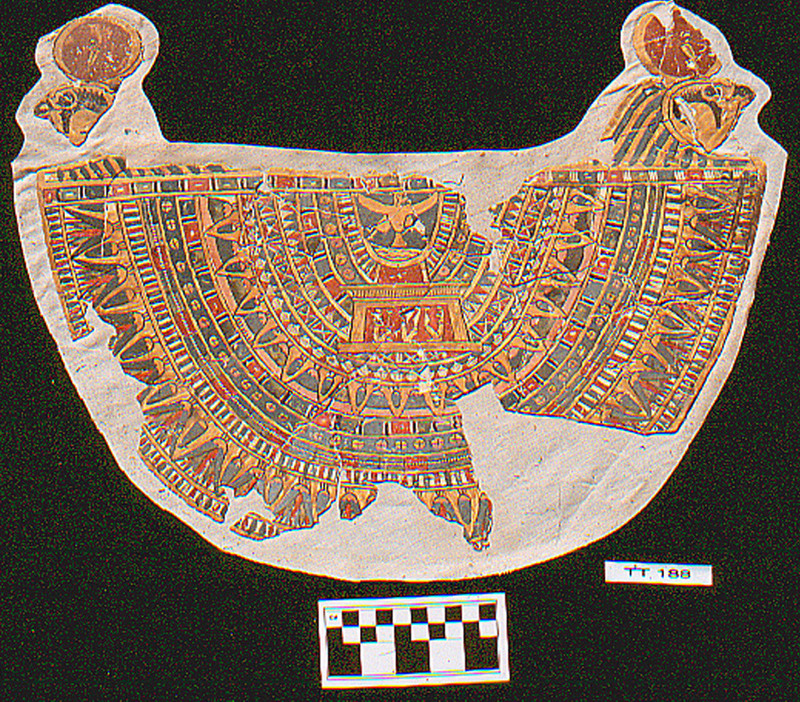 The collar is painted in a vivid array of colors, designs and images that show elements of ancient Egyptian religion. The god Horus is signified by two falcons wearing red sun-disk crowns on the top corners, while at top center is a human-headed bird (called a “Ba” bird) that represents, in essence, the immortal soul of the deceased mummy. Additionally, in the center of the design, there is a drawing of a golden shrine with two goddesses, possibly the sisters Isis and Nephthys, facing a deity in the center that may be the jackal-headed Anubis. The collar is about 8.7 inches (22 centimeters) high (not including the falcons) and about 16.5 inches (42 cm) in width. Near the bottom of the collar lotus blossoms are shown flourishing. Its shape indicates that the cartonnage collar imitated the pattern of a “wesekh”, a special type of broad collar made of beads allocated to consist delicate patterns, which was worn by the Egyptians during special occasions. Who was the person wearing the collar? Inscribed seal used to hold the strings or binding of a papyrus scroll. TT 188, Luxor, Egypt. Photo: Susan Redford. 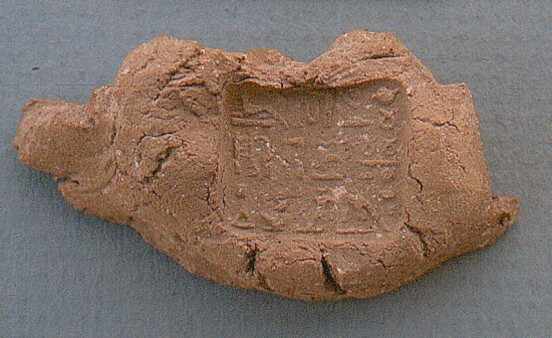 An inscription written in a mud-clay seal was found near the fragments may hold some clues.The seal would have held together the string or binding of a papyrus scroll. While the scroll itself is mostly destroyed, the inscription from the seal says that it is for a man named “Padihorwer,” reading (in translation) that he was “privy to the mysteries and god’s sealer, “embalmer,” scribe, prophet of the “desert” (necropolis) of Qus,” which is located north of Thebes. If this collar, with its elaborate decorations, was worn by Padihorwer, it would suggest that his business prospered and that he was a relatively wealthy undertaker at the time he was buried.